I don't claim to see every horror movie which is released, but it is my favorite genre, so I do try to keep up. (With all of the sub-par offerings which pop up on streaming services each week, I'm not going to waste my time with a lot of the garbage which is out there.) I especially try to take note of important foreign films (or trends in foreign films) which are gaining buzz amongst the crowd which likes more obscure things. A little over a decade ago, we began to see a new crop of extreme horror movies coming out of France. Angry and violent, these films immediately got the attention of American viewers I saw High Tension, Inside, Them, and Frontiere(s), but I somehow managed to miss Martyrs. I read about the film and saw the reviews, but I never had a chance to view the movie. (I didn't get it to review, so that allows lowers the chances of me seeing something.) However, I am now getting a chance to see the American remake of the film. As Martyrs opens, young Lucie (Ever Prishkulnik) escapes from a building in which she was being held captive and flees for her life. She lands in an orphanage, where she is befriended by Anna (Elyse Cole). The nuns at the orphanage worry for Lucie, as she is prone to bouts of hysteria in which she claims that she is being attacked by monsters. Ten years pass, and we join Lucie (Troian Bellisario) as she enters a rural home and attacks the occupants, who appear to be a normal family. But, Lucie is convinced that they are part of the group which tortured her as a child. Anna (Bailey Noble) arrives and attempts to stop her friend from going to far. As they attempt to clean up the bloody scene, and Lucie is drawn farther into her paranoia, Anna realizes that the house holds some deadly secrets. I fully realize that synopsis sounds vague, but part of the implied success of Martyrs relies on the fact that the second half of the film takes a lot of turns which change the focus and tone of the movie. I can say that what opens as a psychological drama and then turns into a sort-of home-invasion film becomes something very different in the second and third act. The somewhat simple storyline becomes far more complex and reveals itself to be at once more serious and more brutal than the first 30 minutes would imply. As stated earlier, I have not seen the 2008 version of Martyrs, so I cannot compare the two, although I know that's what most are looking for in this review. Focusing solely on the new version, I can say that the movie has an interesting plot, but it falls very flat. Screenwriter Mark L. Smith, who has gone from Vacancy to The Hole to the celebrated The Revenant, has taken the original film and crafted a very streamlined story here which moves us from Point A to Point B in a very organic fashion and nicely unfolds the truth of what is happening in the house. Although, I must say that the movie is very vague as to why, beyond the fact that they bonded as children, Anna would be so devoted to Lucie as to help her cover up a crime. The problem here lies in the direction from brothers Kevin and Michael Goetz, who made their feature film debut with 2013's Scenic Route. This is one of those movies which is technically proficient -- everything is as it should be in the sense that it's well-shot, good production design, etc. -- but it simply feels hollow. For the most part, there is always something happening, but the 88-minute running time does not fly by and feels very slow at times. The revelation of the film's real plot sounds interesting on paper (despite the fact that I can't share it with you here), but it comes across with a whimper in the movie, whereas it should be a clarion call to set Martyrs apart from similar movies. But, the film plays like just another women-in-chains film which is saddled with a convoluted premise. 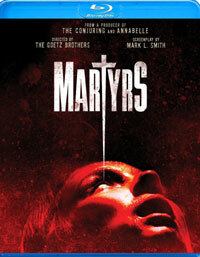 Everything which I've read about the French version of Martyrs describes the movie as a harrowing, numbing experience. This new film certainly does not have that effect. This certainly isn't a family film and there is some gore and violence here, but the entire thing is so pedestrian that it has little effect. Kudos to the actresses who, covered in blood and dirt, clearly went through a lot for the production, I just wish that it had been for a better movie. Now, I guess that I'm going to actively seek out the original. Martyrs made me distrust those who demand a basement lot on Blu-ray Disc courtesy of Anchor Bay Entertainment. The film has been letterboxed at 2.35:1 and the Disc contains an AVC 1080p HD transfer which runs at an average of 30 Mbps. The image is sharp and clear, showing no distracting grain and no defects from the source materials. The colors look fine and the image is never overly dark or bright. The level of detail is good, as the image is rarely soft and the depth works well. The Disc carries a Dolby TrueHD 5.1 audio track which runs at 48 kHz and an average of 1.0 Mbps. Yes, you read that correctly. It's been a while since I've seen one of these low bitrate Dolby tracks. Despite this, we get good stereo and surround effects, which do a nice job of highlighting sounds coming from around the house and the subwoofer effects are notable. The Martyrs Blu-ray Disc contains only one extra feature. "Martyrs: A First Look" (8 minutes) offers clips from the movie, as well as comments from the cast and creative team who describe the story and the tone of the film. (Which hints at plot-points which aren't in the movie.) The piece then looks at the production, complete with on-set footage, as the two leads discuss how demanding the movie was.